A middle school student wrote this persuasive essay to argue for banning smoking in restaurants in her state. Picture this: you’re just about to bite into your delicious Caesar salad at a fancy downtown restaurant when all of a sudden a thick cloud of smelly white smoke drifts in front of your face, obscuring your vision and sending you into fits of coughing. Eyes watering, you fan the smoke away from your face only to discover that the horrible smell from this cloud has now robbed you of your appetite. You drop your fork into your salad bowl and motion for your check. Your meal is ruined. For too long, nonsmoking diners in our state have had to breathe in contaminated air from smokers. Smoking should be prohibited by law in all restaurants. Breathing in secondhand smoke is physically just as bad as breathing in smoke firsthand. Every year, 37,000 nonsmoking people die from heart disease. These deaths might have been prevented if they had not been subjected to secondhand smoke. A 1992 study by the U.S. Environmental Protection Agency and a 2006 Surgeon General’s study concluded that secondhand smoke causes 3,000 heart attacks a year. These same reports also blamed second-hand smoke for 20% of asthma attacks in children. These frightening statistics aside, meals just aren’t as enjoyable when someone is blowing smoke in your face. Restaurants lose valuable customers when smoking is allowed because so many people today do not want smoke in the air while they are dining. This could be stopped if smoking were legally prohibited in restaurants. When adults smoke in restaurants, not only is it bad for their health and the health of others around them, they are also setting a terrible example for kids. By example, they are encouraging kids to smoke, too. If smoking were prohibited in all restaurants, it would help kids not get hooked on smoking. Everyone has the right to breathe in clean air when they dine at a restaurant. To ensure that all diners can enjoy a smoke-free meal, smoking must be banned from all restaurants. Write to your assembly person and encourage him or her to support a law in our state banning smoking in restaurants. It’s the right thing, and the safe thing, to do. Smoking in Restaurants by Thoughtful Learning is licensed under a Creative Commons Attribution-NonCommercial-ShareAlike 4.0 International License. 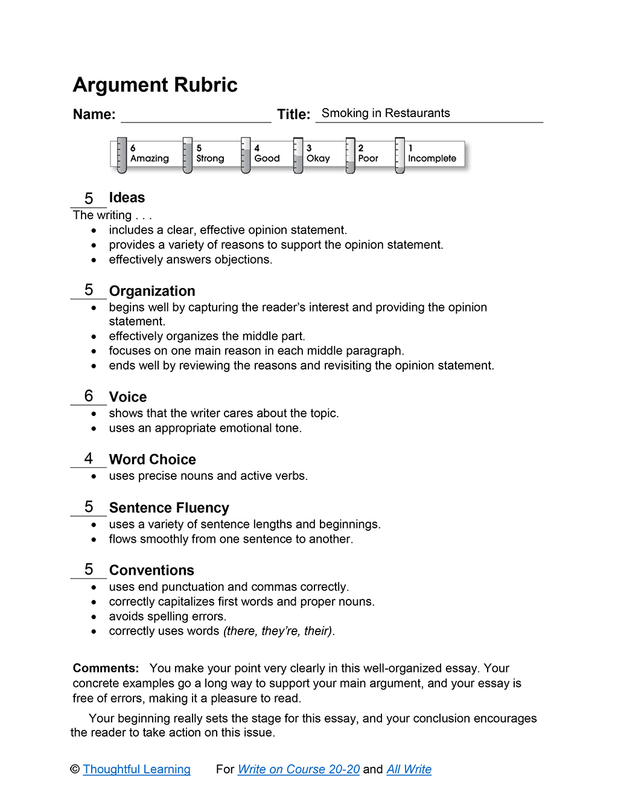 Based on a work at k12.thoughtfullearning.com/assessmentmodels/smoking-restaurants.